This 35 foot flat HDMI cable (24AWG) is the newest and best digital video connection on the market. HDMI is the only cable that can transfer uncompressed high-definition video and multi channel digital audio in resolutions higher than 1080p. Flat HDMI cables are convenient because they will run under carpets allowing the transfer of digital audio and video in a single hidden cable, permitting a less confusing mess of wires and a cleaner entertainment center/room. The HDMI connector is small, which makes it ideal for installers and in-wall use. Flat HDMI cables can be used with any device with HDMI such as HDTVs, DVD players, Blu-ray players, game consoles (PS3, Xbox 360), cable and satellite set top boxes, DVRs, computers, etc. This HDMI cable is a superior product. It is a "heavy-duty" FLAT cable that can be used under carpet or for an "in-wall" installation. No signal loss or speed impedance over the 35 feet of cable. Excellent! Beware this cable. It is very wide. The connectors are so wide they block adjacent connections on surrounding ports unless the other connectors are very narrow. Covering on the cable while appearing quite robust is instead fragile and easlily peels if it comes in contact with any edges. Cable is VERY difficult to bent if you need or want it to stay flat needs a wide swath of area. I.E. big arc. We will use the cables but would not recomend them unless you absolutely have to place the cable under a carpet or other narrow space. CableWholesale Response: These are the drawbacks of going such a long distance with HDMI cables. The conductors have to be very thick to send the signal so far. 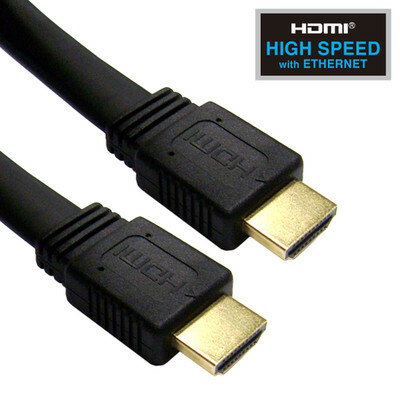 Our flat HDMI cables are specifically designed to go under carpets or other narrow places. We also carry a standard round cable, but that cable is also very thick and stiff when you go 25ft or above. great products, good prices, excellent service.